There is absolutely no reason why you should ignore email marketing in your small business strategy. It is crucial, however, that you approach email marketing in an educated and efficient way rather than a “I don’t know what I’m doing, so I’m just going to click here… and here… I’m over this” way. 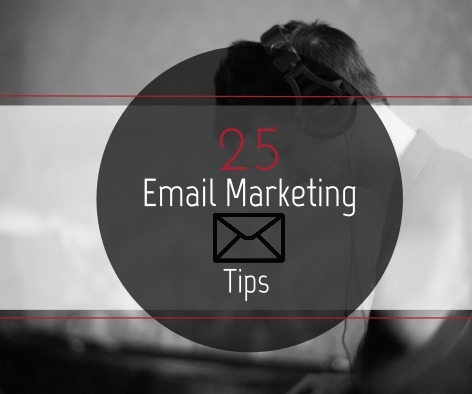 We have 25 great email marketing tips to add to your list of tools, so listen up and take notes! Your email template should be branded to fit your business. Include your logo and company colors throughout the entire message. Your message needs to be scannable. This means: short paragraphs, subheadings, and ample images related to the text within the email. Including a “read more” button is a great way to give your customers the opportunity to “read more” whenever they have time. Avoid using three or more typefaces in your email messages; the less clutter you have, the better. The most effective place for your logo is at the top left hand side of your email header. You will enhance branding efforts if you keep the format of your landing the same as your email messages. Use as many power words as you can, without hindering the cohesiveness of the text in your email. Make sure you edit your content. There’s nothing worse than reading an email that has grammatical or spelling errors. Keep your emails short. The shorter your emails, the higher the engagement. Using “you” as frequently as you can. Basic psychology states that people love talking and hearing about themselves, so give them what they want. Consider creating a Google Calendar for your email distribution; this will provide your customers with stability, and you with organization and better time management. Make sure to test your email on as many browsers and devices as possible to ensure that your message will look good anywhere, anytime. Monitor your email open rate for each email. If one of your emails has a particularly high open rate, make sure to take note, and run with that tactic. If you have a low open rate for a particular message, then try another tactic. Make sure you only send an email when you have something to say; if you don’t have something to say, silence is your best friend. Don’t be afraid to write fast; that’s when your personality will disperse itself into your message. Personality wins in marketing, every time. The best subject lines of emails are shorter than 50 characters, the longer they are, the lower their open rate. If you use a number in your subject line, you will stop wandering eyes from glancing directly over your message.